To most, acne is a mysterious skin disorder that has no go-to cure or treatment. If you have spent any amount of time researching acne, you know by now there are hundreds of theories on what causes acne and what can cure acne. At the Natural Acne Clinic, we know that acne can be controlled. We’ve done it for so many clients who have tried everything else out there and were at their wit’s end and frustrated. With the right combination of products used in the correct way we can get your skin clear! Natural Acne Clinic has a Online Acne Program that will have your acne under control in about three to four months, depending on the type of acne you have (inflamed or non-inflamed) and if we see you in our office or through our Online Acne Program. We combine the power of the Face Reality pharmaceutical-grade non pore-clogging products that are customized for your type of acne along with a series of bi-monthly in-office acne treatments. We educate you on lifestyle choices that may trigger an acne breakout- foods, medication, make-up, birth control pills, stress and common ingredients used in skin care products that may be clogging your pores- even professional and prescription products! We teach you how to use your products and increase the strength of the regimen every 2-3 weeks. Your skin will become accustom to any regimen after a few weeks and will then be less effective over time. This is why we adjust the regimen at each office visit in order to get you clear. You could say we are kind of like a personal trainer for your skin. Having the right products is not enough to get your skin clear- it’s all about having the right regimen for those products that is customized for you and your type of acne. 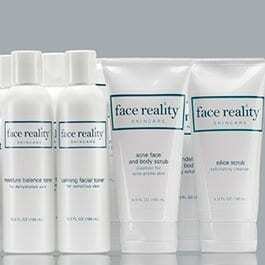 We will show you how to use your products slowly at first so that your skin does not get worse before it gets better. We will never expect you to figure out things for yourself. As your personal Acne Specialist, we will develop a plan for you to tackle your acne, providing strong products with a specific regimen and a balanced approach. When we work together as a team, we find that our client’s acne clears up within 3-4 months.